Basketball Every Tuesday and Thursday! Gather up the family and join us for a safe and entertaining movie night. Free Pizza, KFC, and treats will be served. The movie will be played inside the prayer room. Students must be under parent supervision at all times, NO DROP OFFS! *Event is for Meraj students and siblings are welcome. Students are welcome to come dressed in their favorite (appropriate), pajamas! 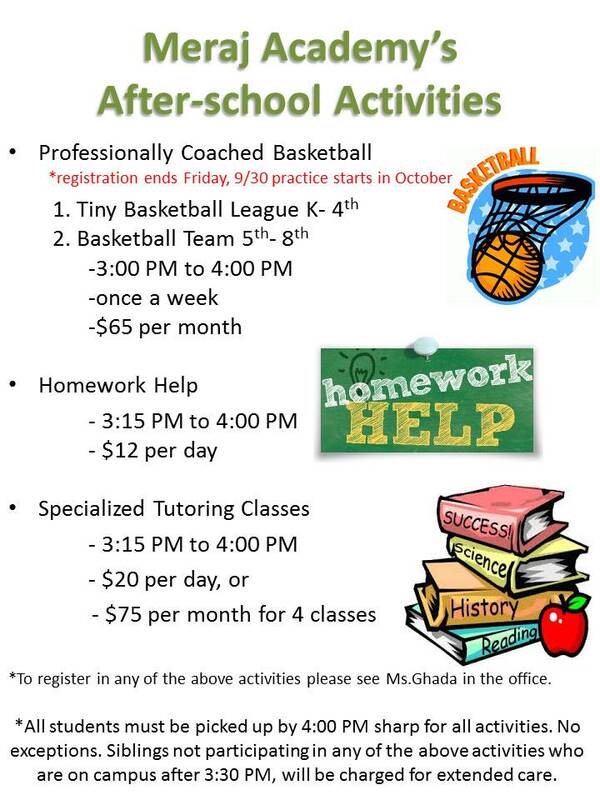 3rd-8th will have practice on Thursday Afternoon. Practice will conclude at 4:00 PM sharp on both days. Water Games, Dunk Your Teacher in Water, Face Painting, Petting Zoo, Photo Booth, Henna, Velcro Wall... and much more! Salam Parents & Students, and WELCOME BACK!!! Meraj Academy's first day of school for Fall '15 will be Wednesday, September 2nd. Buy tickets here. $40 Pre-sale | $50 at Door. Meraj Academy's School Math Competition. In memory of all the Americans who serve our country, Meraj Academy will be closed in observance of Memorial Day. Thank You to all those who serve us. Students will be taking their yearly standardized testing, Stanford Testing. Our student's are amongst the highest performers in the nation. Pizza, Popcorn, Cotton Candy, Drinks and other snacks will be on sale. *Children must be under parent supervision at all times, no drop offs! You may bring a blanket or picnic sheet to sit on.